In this version of our DBGrid demonstration we show how you can display some fields in a DBGrid, and a field of the selected record in a DBEdit or a DBMemo. We downloaded the zip file from the Microsoft Access page in the Lazarus Wiki. We used some of this code for our buttons to edit a Microsoft Access table and to delete and insert a record. This builds on the previous section, where we displayed the contents of the table in components.mdb. 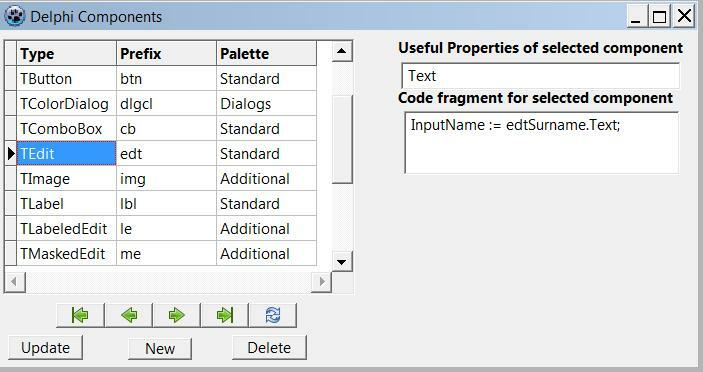 These components are data-aware and so you just need to set the DataSource property to DataSource1 (the only data source in the drop down list in the Object Inspector). The New and Update buttons update the database with data edited in any of the three data-aware components. You need to be careful to write the SQL strings correctly otherwise you can edit whole columns in the table inadvertently. Always keep a backup of a valid database! We added to the form the three buttons (from the Standard tab) and the DBEdit and the DBMemo (from the Data Controls tab). 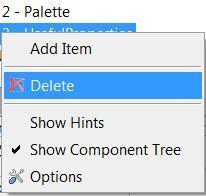 You can see the code for the buttons in uDatabaseEdit.pas and the properties of the components in uDatabaseEdit.lfm. We have emboldened important properties. The essential code of the files needed for program DatabaseEdit follows. You can download the three code files, the database and our components.dsn file in form_database_edit.zip. You will probably need to change the path of the database. The Microsoft Access page in the Lazarus Wiki explains how to create your own .dsn file if ours does not work for you.